Here are a couple of more cards from my weekend retreat! The first is a quick and easy Thinking of you card and the second would be a great Thanksgiving card. 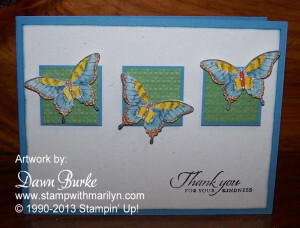 The first card is made with Papillon Potpourri stamp set. What a great thinking of you card! This card was designed by my friend Dawn Burke. She used the square lattice embossing folder to add a little dimension to the gumball green background. This next card was designed by me. I used the Truly Grateful stamp set with the woodgrain embossing folder. I used soft suede ink with a sponge to add a little color to the wood grain background. the second layer is stamped with pool party and the background stamp that is part of the Truly Grateful stamp set. Next is a piece of Sweater Weather designer paper cut using the labels frame lit die. This piece and the pool party background piece are sponged along the edge with soft suede ink for a little dimension. I stamped the Wheat with cajun craze and tied a piece of linen thread around the wheat. I then stamped the piece of wood and the chestnut with soft suede ink and cut those out. The banner is stamped with the Gorgeous Grunge set and sponged with the soft suede ink. Gorgeous grunge is a great set to create backgrounds. The last post will be tomorrow with the last couple of cards! Want to participate in our spring retreat?? Join my team!! We do a Girls weekend twice a year to the cape and have a great time!! We all learn something new – even us old dogs that have been stamping for 12 years! !